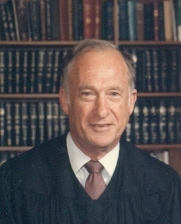 Retired State District Judge Israel Allan Lerner passed away on Thursday, February 28, 2019 at The Farrington at Tanglewood in Houston, Texas. Allan was born to Miriam and Lazar Lerner on September 1, 1926, in Galveston, Texas where he lived until he graduated from Ball High School. He then pursued his education at Texas A&M University followed by The University of Texas School of Law where he graduated in June, 1951. Upon graduation, Allan returned to Galveston County to begin the practice of law; practicing civil law in La Marque including serving as city attorney of the cities of La Marque and League City, and other local governmental bodies. In 1980, Allan was elected Judge of the 56th Judicial District Court of Galveston County; an office that he held by election for 16 years without opposition. He then continued to serve as an appointed visiting State District Judge until 2006 when he fully retired. While in law school, Allan met Joyce Rae Rosenberg of Brady, Texas and they were happily married for married for 35 years until her untimely death from cancer in 1990. Together they had three children, Robert Lerner and wife, Leslie, Randal Lerner, and Donna Mazow and husband, Mark, in addition to 4 grandchildren, Geoffrey, Steven, Allison, and Jake. He was also predeceased by 2 sisters, 2 brothers, and their spouses. In 2001, Judge Lerner married Helen Tapick and his family grew to include her son, Michael and wife, Betty, their 2 children, and great grandchildren. A memorial service will be held to honor Judge Lerner on Sunday, March 3, 2019 at 11:00 A.M. at J. Levy & Termini Funeral Home, 2128 Broadway, in Galveston, with Rabbi James Kessler officiating. Interment will follow at Congregation Beth Jacob Cemetery located at 61st and T ½, in Galveston. Memorial donations may be sent to Congregation Beth Jacob Cemetery Inc., Congregation Beth Jacob General Fund, 2401 Ave. K, Galveston, Texas 77550, or Congregation Beth Israel, 5600 North Braeswood, Houston, Texas 77096.